Snow is finally on the ground. "Yuk," some say. These are the people who must commute to work, inside, everyday. But for most Alaskans, the snow is greeted with great enthusiasm. Kids can make snow angels. Skiers can get out of the gym and onto the trails. Snowmachiners can tune up their machines. Trappers can finally read tracks. All of these folks are overjoyed that winter has finally arrived. Happiest of all are the dog drivers and their charges. Mushers and sled dogs are built for snow. I know dog people who actually cry when the last of the useable snow melts. Yes, they are crazy. But it is a beatific craziness. Those who don't know the mushing community associate dog drivers with races like the Iditarod or the Yukon Quest. That is the most visible sled dog activity to the uninitiated viewer, but it is just the tip of the iceberg. Most of the rest is out of sight. Skijorers may have only a dog or two. Touring kennels may carry a yard of 50 or more. The largest number of kennels are recreational yards. Recreational dog teams usually have between four to a dozen animals. Their ages vary, although many come from the same litter. Some rec kennels consist of dogs that were just short of making a race team. Most are pets and become accustomed to coming in and out of the house. There isn't much snow on the ground yet. Those with smaller groups of dogs can get out on sleds with well-mannered five-dog teams on sleds. Large kennels must still use a machine. The sled is fun, but the truck runs also have an attraction, though the main objective is training. The Denali Highway is a favorite location for conditioning race teams. There is always early snow in the Denali country, and the highway is officially closed. Mushers serious about race conditioning can hook up huge teams to their pick-ups and travel extended miles. The dog box travels with them, thus they can stop for the night anywhere they choose. Large numbers of dogs can be tested and conditioned on long runs. This works great for big kennels who must exercise many dogs. There are drawbacks. While 24 dogs can be physically conditioned while hooked to a vehicle traveling down a highway, training by this method is much tougher. There are few gee/haw turns along the Denali Highway. The tendency of the driver is to keep traveling at a steady pace, which makes it tough to accomplish any interval training. Long runs at a steady pace can contribute to a higher number of stress injuries than shorter exercises at varied speeds. Today's world of competitive dog driving is still focused on the highly visible 1,000-mile events. The 2019 Yukon Quest is seeing a resurgence in entries with 27 mushers signed up, one-third of them rookies. The Yukon Quest runs earlier in the season than the more famous Iditarod. Colder. Darker. There are long, lonesome stretches between checkpoints. The upside is the Quest's numerous hospitality stops. There is less commercialization on the Quest. The veterinary care is excellent, with the majority of the same crew present at checkpoints. Mushers also see their handlers or spouses at many of the checkpoints and are able to turn over any dropped dogs to them. In spite of these perks, in recent years approximately half of the Quest field fails to finish the race. People will tell you that it is the cold. Maybe. Maybe it is the loneliness. The modern dog driver is not as independent as the woodsman of the past. That may explain the popularity of the Iditarod trail. Highly publicized, media- and sponsor- friendly, the Iditarod is attractive to the urbanized teams of today. 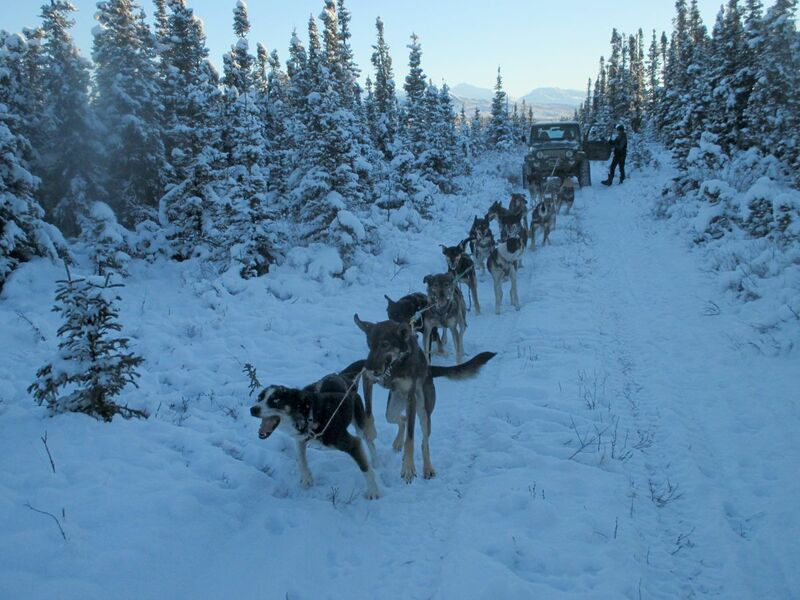 There are few trapline dog teams left in Alaska today. None of those few can take shot at the Iditarod with it's $4,000 entry fee and associated costs, which will drive the total race expenditure above $15,000. Also, the perception is that a 12-dog yard can't compete with a 50-dog racing kennel. Rule changes for the 2019 Iditarod may slowly begin to bring welcome change to the race. The new rules, while not perfect, are a step in the right direction. Back in print is the rule that a musher with an expired dog, unless caused by an inherent force of nature or unpreventable hazard, must voluntarily withdraw from competition. This is a rewrite of an old Iditarod rule that was originally taken from the Copper Basin 300. That rule went away after a challenge by five-time Iditarod champion Rick Swenson after one of his dogs died during the race. The reduction of team size to 14 dogs and new required kennel standards have irritated some of the customary Iditarod entrants. With 40 entries so far, the 2019 race could have the lowest number of competitors in decades. While there may be fewer Iditarod teams, there still seems to be plenty of dogs on the trails. Race rules will evolve. Some people will celebrate the changes, others will abhor them. No matter, this is Alaska. As long as it continues to snow, there will be sled dogs on the trail and dog drivers ecstatic over the first real snowfall.